Nicky and I have been friends with Maura Carey Neill for many years. We were thrilled for her this time last year when her new blog venture 365 Atlanta took off like wildfire. This site (365Atlanta.com) provides a daily tip on something to do in Atlanta . . . restaurants, bars, shopping, events, festivals, music, art, recreation. It has been a great tool for native Atlantans and for newcomers to our city. As Maura and 365 Atlanta celebrate their one year anniversary, we at Our Libatious Nature decided to give the ultimate gift – the gift of libation. We have created a cocktail we call “Maura’s March on Atlanta,” in honor of her achievements. The first step for Nicky and I was to determine what exactly is the flavor profile for Atlanta? Sweet tea. Peaches. Hooch. And for some reason we kept referencing Sherman’s March on Atlanta. Maura is not a local; however, her march on Atlanta has been a much more positive and kinder approach. The tea component was easy. Luzianne Tea right off the shelf of the Publix store. Done. The “hooch” we originally thought would be a Georgia corn mash. Then the good folks at Bulleit released their own rye whiskey March 1 and we were sold. 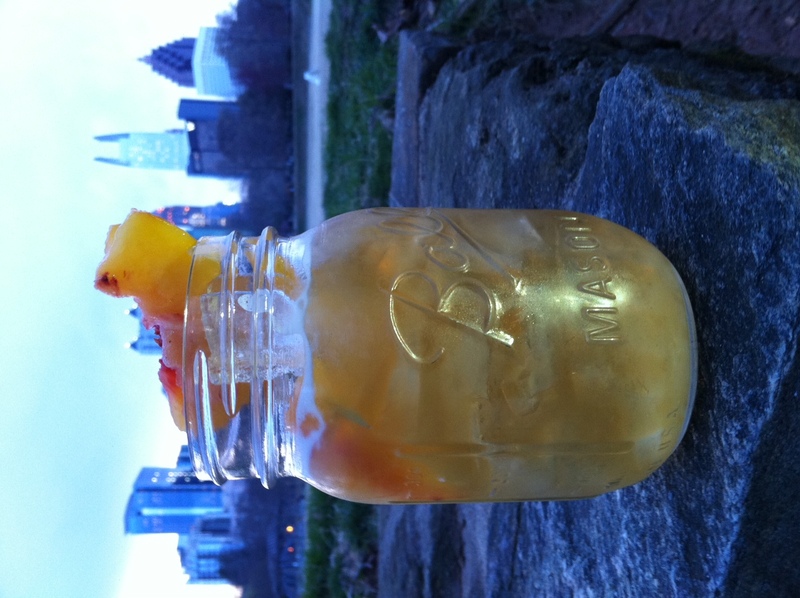 We muddled the peach slices, added the tea and the rye and sweetened with a simple syrup. Not quite right and we really wanted to add a burn on the back end to represent the fire and rising from the ashes. The simple syrup soon became a simple tea syrup infused with a habanero pepper. The final touches were a splash of Mathilde Peach Liqueur and some orange bitters. Of course this is a drink to serve in a Ball Mason jar. And being the resourceful people we are, we figure you can actually mix it in the jar, put on the lid, shake, then enjoy right out of the jar with a peach slice garnish! And with Maura being all over town as she is, she really needs a portable potion. Thanks, Maura, for keeping us all in the loop about what is going on around our city. March on! Muddle peach slices in bottom of shaker. Add all ingredients with ice and shake. Strain and serve over ice in a mason jar. *Habanero infused simple tea syrup: Mix 1 cup of your tea and one cup sugar and boil it to a syrupy consistency. Add one habanero pepper cut in half. Allow to co-exist for a few hours in a sealed container. intelligently about. I’m very happy that I came across this during my hunt for something relating to this. Hello! I want to start by saying my name – Jenna Hassel and Really feel comfortable typically use complete name. agency # # # # but I’ve already inked another two. One of the things I love most is cycling and i won’t stop doing work. the weblogblog site. Were you attracted?